With the TT Login dialog box, you can easily log into multiple exchanges at once. Your individual MemberGroupTrader IDs are mapped to one Username in TT User Setup. Simply type your Username and Password in the TT Login dialog box and click the Login button. Note: TT SIM is a separate application that allows you to test your custom trading programs against a live production price feed via a simulated matching engine running locally on the X_TRADER workstation. The TT SIM radio button will be grayed out and unavailable if TT SIM is not installed on your workstation. See the TT SIM section if you would like to explore TT SIM functionality in greater detail. 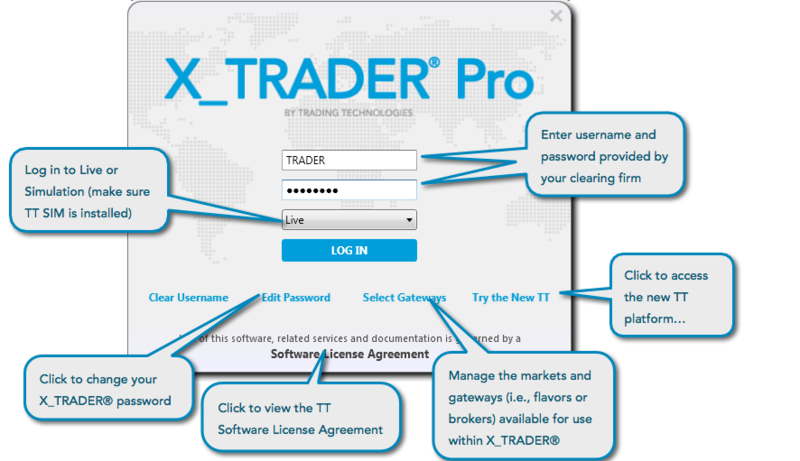 Login is complete when the X_TRADER Control Panel displays with buttons enabled as shown.